Reviews have started to come in for my young-readers adaptation of Charles Darwin’s most important book, On the Origin of Species. So far, so fantastic! Publishers Weekly says, “With valuable modifications and enhancements, Stefoff preserves the richness of Darwin’s content for contemporary young readers.” Read the full review here. Kirkus praises the adaptation for being “so handsomely presented and so close to the source” and says, “Stefoff’s frequent glosses and boxed side essays unpack major concepts, add historical context, explain how later scientific discoveries modify or support Darwin’s broad picture, and even studiously point out where the author went wrong.” The full review is here. 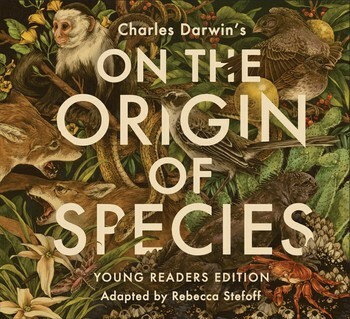 The Junior Library Guild has named Charles Darwin’s On the Origin of Species: Young Readers Edition as one of its selections. The book, soon to be published by Atheneum Books for Young Readers, a Simon & Schuster imprint, will be shipped to some 1,400 school and public librarians who subscribe to JLG. This is a big boost for the book, as being chosen by the JLG generally results in improved visibility and sales. I couldn’t be happier–or more eager for the book to come out. Just half a year from now, Simon & Schuster will publish my young readers edition of the most important scientific book ever written, a book that became a key foundation piece of modern biology, as well as a landmark in our understanding of the world in which we live. I was twenty-three, studying English in graduate school, when I first read Charles Darwin’s On the Origin of Species. In the years that followed, as my nonfiction writing career took me deeper into writing science books for kids, I reread On the Origin of Species several times, alongside many more recent works on natural history and evolutionary biology. So once I’d published YA adaptations of books by Howard Zinn, Jared Diamond, and others, it was perhaps inevitable that I’d think, “What about Darwin?” And here we are. Bonus: The Young Readers Edition is not just for kids. It’s for anyone who’d like to read a shortened, streamlined, illustrated version of On the Origin of Species. I’m working on a young people’s version of Charles Darwin’s book On the Origin of Species. I feel a great sense of responsibility. The Origin introduced the world to Darwin’s insights about how species of plants and animals evolve and change over time, giving rise to new species. Since Darwin’s time, scientists have learned much, much more about evolution, species, and biology in general. Still, the Origin is one of the most important and influential books ever written. I am striving to offer the best possible adaptation of it to readers both young and old. I’m also thinking about treating myself to something special when the book is finished. I’d love to visit Down House, the home in England where Darwin lived with his family for forty years. Although Darwin had begun to develop his ideas about evolution before he moved to Down House, it was in this study that he wrote the Origin and his later works. I’d love to enter this room and try for a moment to see the world as he saw it. I’m thrilled to report that I’ve signed with Atheneum Books for Young Readers, an imprint of Simon & Schuster, to write an adaptation of Darwin’s On the Origin of Species for kids and young adults. I could not be happier about it. It is a dream project for me in many ways. Years ago I wrote a book called Scientific Explorers. It was the third volume in my Extraordinary Explorers YA trilogy for Oxford University Press, and it contained a chapter on Darwin, one that I was happy to see drew special praise from several reviewers. I went on to write a YA bio, Charles Darwin and the Evolution Revolution, also for Oxford; it remains in print, twenty years later. Since then I’ve written a number of children’s and YA books on subjects related to Darwin’s work and to evolutionary biology, including a four-volume series for high-school-age readers on human evolution. I also recently adapted Jared Diamond’s book on human evolution, The Third Chimpanzee, into a version for young readers. It was published in North America by Seven Stories Press, and it has also been published in a dozen or so other countries. This new project, adapting Darwin’s own words for kids–while keeping as many of them as possible just as he wrote them, and adding sidebars to bring the science up to date–feels like the next stage in my long history of being involved with Darwin and his world-changing achievement. It also feels like an enormous responsibility. Stay tuned for updates as I strive to meet the challenge.